A movement for change first starts with an idea, a seed, if you will. Once it takes root, you can watch it grow into something tangible for others to follow. 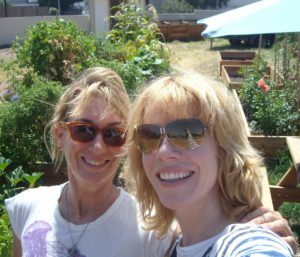 Well, that is literally what Los Angeles-based television writer/producer Cyndi Hubach did in 2010 when she planted her first seed in the Elysian Valley Community Garden. 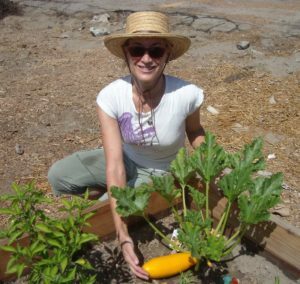 With little experience, but plenty of desire, Cyndi started a local garden to unite her community and, ultimately, improve the planet. EYE: I am so proud of you!! 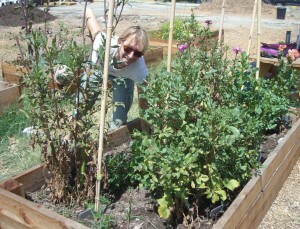 What prompted you to start a community garden in 2010? CYNDI: I am pursuing a Masters in Urban Sustainability at Antioch, which really examines how do we fit nine billion people on the planet in a way that won’t cause the destruction of the planet. Most people live in cities so that’s why it’s called “urban” sustainability, and more and more people are moving to the cities. So one of the theories is that we need to bring some of the processes closer to where we live. The way we operate now is we go to the grocery store, food comes in, we buy it, and then we throw a bunch of stuff away; everything happens away from us. Nature operates in a cycle and often we are removed from those cycles. A garden puts you back in touch with the natural cycles of the planet: you grow your food, consume your food, the plants and waste goes back into the soil and you’ve become a part of that natural cycle. My school encourages you to go out into the community and put what you learn into practice. It’s very much about applying what you learn, and making a difference in the world. This is not just about academic study; it’s not an ivy tower. It’s to go out there and make a difference and to learn from the experience. EYE: Had you done any gardening before taking this on? CYNDI: Yes, I enjoy gardening. My dad loved gardening and really instilled that love in me. It was something I felt a connection to and a love for, and it was something I could do. I also happened to be fortunate to own a piece of vacant land in the Los Angeles area and thought: what can I do? I can start a community garden. It’s a simple, small thing that one person can do. EYE: So tell me about your community garden? CYNDI: We have 18 beds right now. We are planning another dozen in the next month or so. The goal is three dozen. The long-term plan is to remove the parking lot on the property and put more beds in. EYE: How does someone in the community get involved? CYNDI: You become a “member” of the garden. Membership gives you one bed for one year. 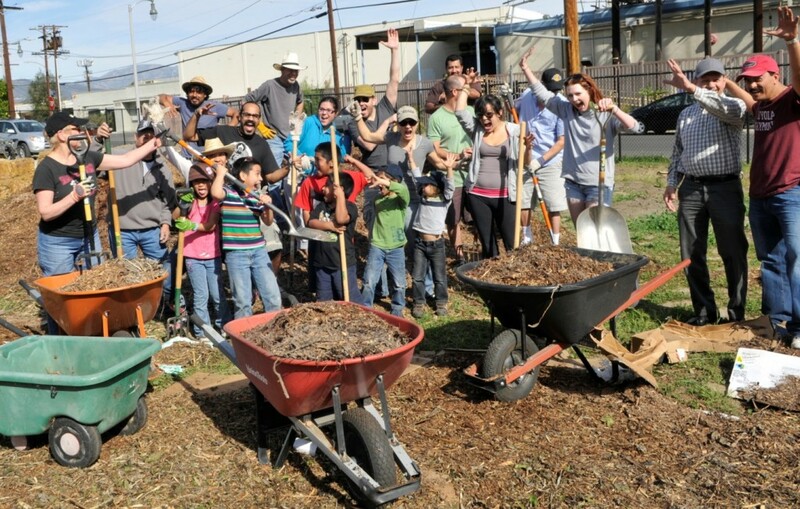 We have local residents, people who want to grow their own food, people who want to get back to nature, meet their neighbors, make friends, and get involved in the community. It has been amazing. I’ve met so many wonderful people. I knew a couple of them but mostly, its brought all new people to my life, and hopefully there will be many more to come. EYE: What is the investment for a new gardener? CYNDI: It costs $60 per year. For some people, it still is a struggle to come up with that amount, so we’ve waived the fee for the rest of the year. And we might reduce the fee next year. We really want to make it accessible to everybody. You do have to buy your plants, but we do want to encourage a seed-exchange so that this will always be a self-contained project. EYE: Is your hope that others will take your lead, that you’ve planted a seed so-to-speak? CYNDI: The hope is that this will take root. So many people have no idea where their food comes from. 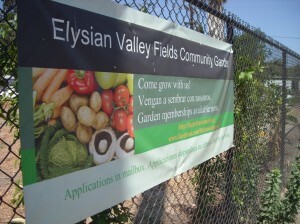 This is Elysian Valley, a working-class neighborhood. There are some single-family homes that do have gardens but a lot of people don’t have access to dirt or even a place in their backyards to grow. The advantage is you can do it with your neighbors and get to know them. We are so disconnected from one another in a lot of ways. I think the theme for the garden is connection: to get connected to the Earth, to get connected to your neighbors, and to get connected to your food. CYNDI: Yes, and what you grow does taste better than the food you buy in the market. Maybe that comes from the idea that “I grew it myself.” The produce is fresher, and it didn’t travel a long way to get to your table. EYE: So you had the land…but how did you go about getting the garden started? 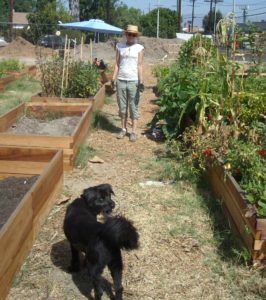 CYNDI: The Los Angeles Community Garden Council is a non-profit organization that supports these types of gardens, and they will act as your fiscal agent. The Council has a master gardener who lives in the neighborhood and is helping and teaching us. When people hear about this, they get really excited. A man who works with the local schools who lives nearby is helping us with growing natives so we can attract native pollinators. EYE: Are we pretty much in the dark when it comes to gardens and helping the planet? CYNDI: Most people don’t think of it in terms of saving the planet. Many people really want to be involved within their community and want to improve a vacant lot that was only a place for dumping old sofas. It’s about pride and making it a more beautiful place to get to know their neighbors. Some people want to get into the dirt and grow things. People who have kids want to teach them where food comes from so they don’t think it just comes from the grocery store. And there is this do-it-yourself kind of aesthetic now. There’s creativity in this. EYE: How do you feel about what you’ve accomplished so far? CYNDI: Well, it’s a really slow process. I wish we were further along. I lost my dad in the midst of creating this, so that put things on hold for a while. This is very much in his honor. 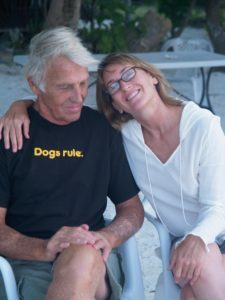 At the end of his life, his main focus was on making other people happy. I just want to be sure that I carry that on for him. 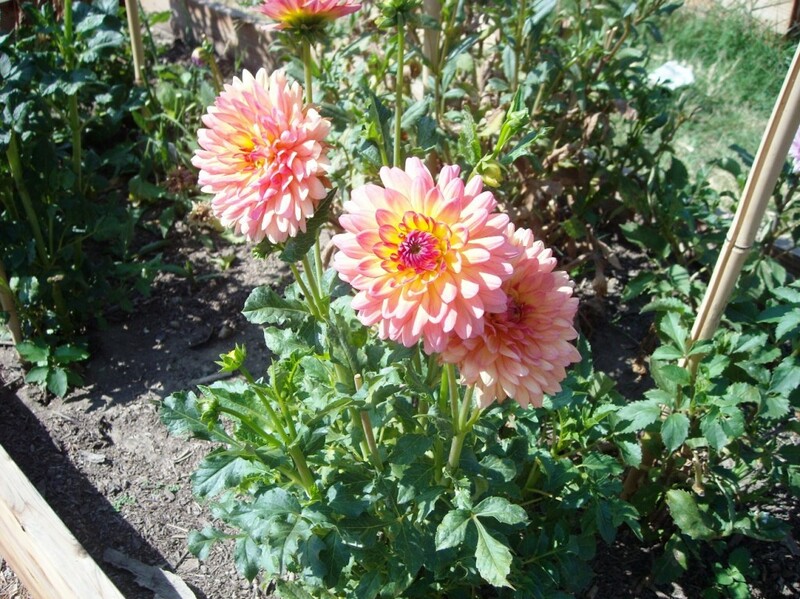 The dahlias are for my father. He thought a beautiful flower could brighten anyone’s day, and there was no flower more beautiful than a dahlia. So that garden is for him. I’m pleased with where we are now. I can’t wait to get more beds in and get more people here. EYE: What obstacles have you encountered? CYNDI: The challenges have been raising money, and some people in the community were not sure what I was up to. Was I trying to enlist community support for something that ultimately would only benefit me? I needed to persuade them that this really is their garden. This is not about me, except that I want people to enjoy it and make friends here and maybe get some health benefits. So overcoming that was unexpected. I thought everyone was going to love it… I mean what’s not to love? Also, there is the challenge of getting people involved. I’ve had to learn how to lead and organize. I have no experience in any of this. I’ll think, “Wow, we had a successful day,” so we’re off and running, but no. There’s the next day and you have to organize it some more and get people involved and excited again to bring them back. You build momentum and then it wanes. It’s been a steep learning curve for me. But I could never give up on this. We’ve come too far to give up. EYE: Are you one of few people doing this? CYNDI: I’m a rare private property owner doing something like this. 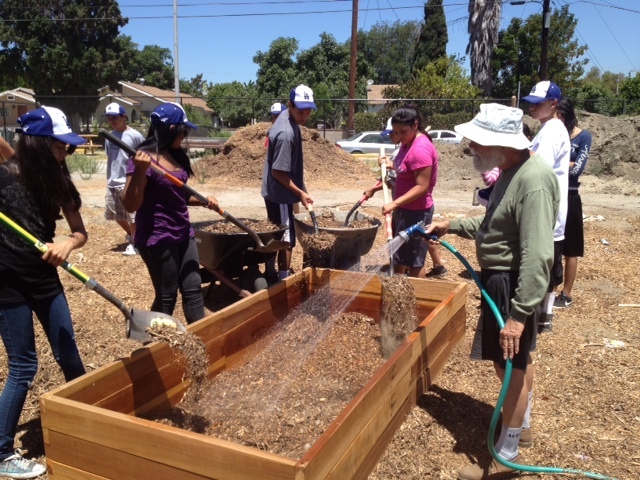 Most of the community gardens in L.A. are city or county-owned lots. I could have built condos, or houses. There are many things I could have done. So there was an opportunity cost to me. I pay the property taxes on this. It is a lot of work. Most people would not do this. But I hope more people will do it because there are available lots out there. 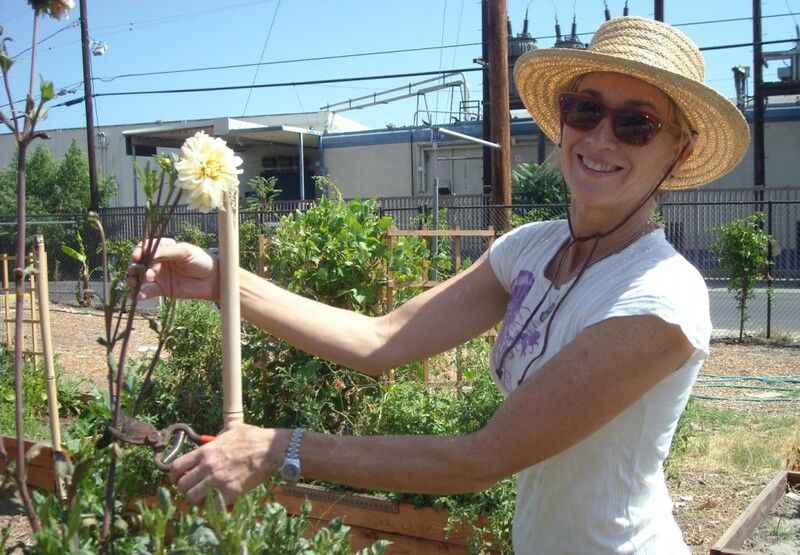 In L.A., there have been a static number of community gardens. I think it’s a growing trend because people do want to get back to the earth and get in touch with their food. EYE: Will that trend continue the more we hear messages like the First Lady’s about growing our own gardens? CYNDI: The message most people get is go to a fast food restaurant, buy this, shop here. There’s very little in the way of a counter-message that you can grow your own food. You’re told to eat a vegetable every once in awhile, but there’s not a “vegetable council” telling you to eat your broccoli. You just don’t get that message very often. It’s an uphill battle to counter all the sugary drinks and all the things that are making us fat and unhealthy. CYNDI: It’s really all about the soil. If you’re having trouble with your plants, it’s probably in the soil. You‘ve got to make sure that you have a lot of organic material, and something that will hold water. Pay attention to where the sun is in your garden. You want to plant your vegetables in a place where they will get at least six hours of sun. But if you have lettuce, you might put them in a shady spot because it doesn’t like a lot of sun. Have a compost pile so that when you have your kitchen scraps and yard trimmings, you put that back into the soil through your compost pile. The city provides soil for free; all you have to do is go and pick it up. Try to go into your garden every day and see what’s happening. And wear gloves. This is not a hands-off proposition. It’s a get-dirty proposition. So you have got to get out there and dig in the dirt!!! EYE: What are your future goals? CYNDI: We have to find a way to integrate human beings into the workings of the planet; again, it’s all part of this natural cycle. I want to work more now with people, and help people get in touch with what they can do. I’m not really sure yet whether it would be in policy or working with a non-profit. But this has taught me how to start something and organize, even though I’m still learning. EYE: You were “green” when you started, but has that been a welcome part of your journey? CYNDI: I was a total novice. This has been a baby step version of what it means to be a community organizer. It’s important and powerful. Look at how divided we are as a country and how that can trickle down to the community as well. But you don’t hate someone you know. You don’t hate someone you are gardening with. This is a way for people to see the humanity in their neighbor. We are all in this together. We can work together to make the world a better place. And it can all start at a small level, like something as simple as a garden. EYE: Thank you, Cyndi. And I know your Dad is very proud of you. Happy gardening and save me a big yellow squash!!! Congrats Cyndi! The garden looks magnificent, but more importantly the neighbors have really come together over this and you likely have one of the most diverse gardener demographics in the city!!! Perhaps we have a monthly event where people enjoy the garden with a parked food truck once a month!!! I would definitely go!